Healthy Ride officials have tracked more than 40,000 trips by Steel City cyclists since launching earlier this year. This conversation was aired on Essential Pittsburgh on October 27, 2015. “As we are able to reach out to more neighborhoods and educate more people about the concept of bike share and the possibility of building in some active transportation to their daily lives, (we expected) that those numbers would increase over time, and that’s exactly what we’re seeing,” he said. White said there was considerable bike share activity Downtown, and that it appears many people are also using the bike share to commute to and from work. He said stations at the tops of hills, such as on Penn Avenue at 42nd Street, often see more rentals than returns. People might be riding the bikes down the hill into Lawrenceville or Downtown, and then taking a bus or ride share back home. White said his team made a purposeful decision to create a very low barrier for entry to the program. Users don’t have to fill out a long profile with detailed demographic information, and the first ride can cost as little as $2. 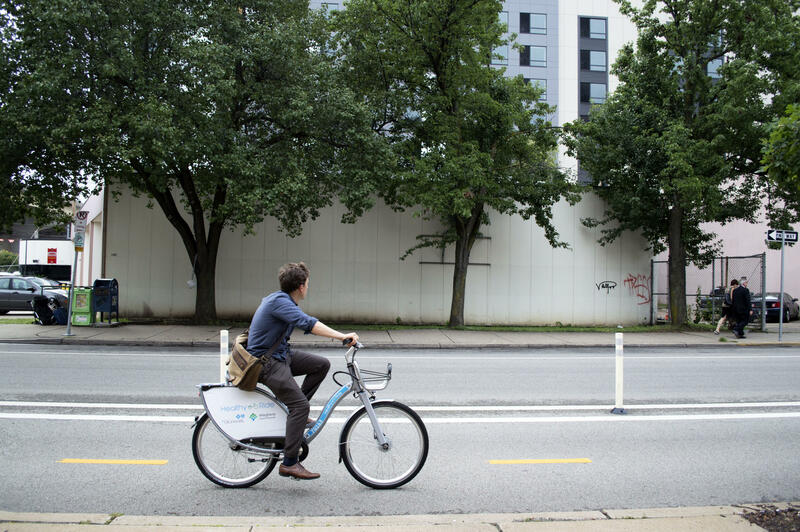 He said that sets Pittsburgh’s bike share program apart from many of its European counterparts, which collect demographic information and have a higher up-front cost. “We (made) a decision to make it … more like another form of transit, where if you’re riding the bus, you don’t have to become a member of the Port Authority, you just take advantage of a bus route,” he said. White said he was surprised that the data showed some people taking bikes out for several hours and paying the $2 per half hour fee. However, most of the trips were under either 30 minutes or 60 minutes, consistent with Healthy Ride’s pricing structure. With more bicyclists on the road, safety concerns are heightened, a fact that was driven home on Friday when Susan Hicks, a University of Pittsburgh staff member, was caught in a multi-car collision while waiting at a red light on Forbes Avenue. White said he was an acquaintance of Hicks, 34, and deeply saddened by her death. He said the city needs to find ways to make streets safer for everyone. The city is currently working on extending the Penn Avenue protected bike line two more blocks to Stanwix Street. The lane is eventually expected to take riders all the way to Point State Park. A protected bike lane is also being installed on East Street in Spring Hill. Healthy Ride’s ridership data is available on its website. White is encouraging the public to use the data to create visualizations, similar to those created with data from Chicago’s Divvy bike share and New York City’s Citibike program. Dozens of bicycle rental kiosks have popped up all over Pittsburgh in the last month as part of the city’s new Healthy Ride system. 90.5 WESA’s Megan Harris reports those first 500 bicycles are just the beginning. Pittsburgh Bike Share swayed more than 7,000 riders into 10,000 trips in Healthy Ride’s first month of operation. Pittsburgh Mayor Bill Peduto makes his monthly visit to the show. He talks about this week's educational summit in Pittsburgh focusing on sustainable urban development and how it will establish Pittsburgh as "the city of the future" as well as the city's new bike share program. Peduto says that, after a long period of managing decline, it's time to help the city grow. When looking at sustainability, however, he says we still have to proceed carefully. "We don't want to put too much salt in the soup. We want to be able to make sure that the growth enhances what we already have... We want to be able to hit standards that exceed world standards, or at least match them, to make Pittsburgh a world leader once again on a global scale." Also in today's show, Margaret Krauss throws back to opening day 80 years ago, when the Pittsburgh Crawfords were the best name in baseball. President of the Senator John Heinz History Center Andy Masich reveals the contents of John Brashear's time capsule, found beneath the Pittsburgh factory where he worked as a leader in developing scientific tools. Pittsburgh is putting more capital budget dollars into bicycle lanes and infrastructure this year than it has in recent memory, but it’s still not enough to accommodate the growing number of cyclists on the road, according to Patrick Roberts, Pittsburgh's principal transportation planner.